30 items; winners will be selected every 2 days. *What’s a prototype: a prototype is a new type of product that is not yet ready to be made in large numbers and sold. We’re creative and always have new innovated products every year. Before the new launch, we’d like to hear from you, the distinguished customers who’ve shared with us your ideas about our products or service. We cherish all voices from you. Your feedback will help improve the product and shape the future of the product. Therefore, we’d like to invite those awesome customers like you to join in our Play and Say feedback program. 5. Anything you want to tell us. Send us a screenshot of your reviews/comments once you’ve left about any Reolink product on our official stores, like Reolink official website, Reolink Amazon Store, Reolink eBay Store, etc. *By clicking submit, you agree to the rules of prototype application below. The form field cannot be empty. 1. These unlisted products are in a limited stock (30 items) and we will select 30 winners randomly. 2. You are required to send us a screenshot of any review or comment once made about Reolink products or service on any of our official stores (like Reolink official website, Reolink Amazon Store, Reolink eBay Store, etc. ), as well as the URL of the page your review/comment is on. 3. Participants with reviews once made on our official stores which include pictures or videos about Reolink products will have a bigger chance to win. 5. All the lucky winners will be announced on April 19th, 2018 on this page. We will also send you a confirmation email. 7. Once you receive the product, you are required to submit your feedback on the page below within 2 weeks based on how you use and test the product. 8. Warranty, refund or replacement are not available for the products you have received or will receive in Play & Say feedback program. From 4MP to 5MP, 3072*1728 (16:9) and 2592*1944 (4:3); see clearer and more. Advanced tech PoE, only a single network cable for both video and power transmission. With a built-in microphone, not only videos but also audio for live streaming. IP66 waterproof enables it stand harsh weather conditions, rain or shine, outdoors or indoors. Detect any dangers and trigger alerts; send you push notifications, emails, etc. in real time. Infrared night vision captures any event & details clearly even in the dark. Remote Access to the camera anytime anywhere to see what happens in real time. Plug and play, easy setup and no configuration. Install it in the way you like. Die Reolink 410 5MP IP Kamera ist sehr gut verarbeitet. Die Installation geht sehr schnell. Der Betrieb ist sowohl mit einem Netzstecker oder mit POE möglich. Sobald die Kamera im Netzwerk ist, kann man diese über die APP konfigurieren und ausrichten. Die App ist selbsterklärend aufgebaut. Auch kann man die Kamera mit einer SD Karte ausstatten. So ist eine externe Software zur Speicherung überflüssig. Die Aufnahmen der Kamera sind wirklich sehr gut. Die Nachtsicht ist von der Reichweite in Ordnung. Anmerkung: Ich habe die Kamera zum testen kostenlos von Reolink erhalten. I have been very happy with my Reolink NVR and 8 camera system. I have multiple 4MP and 5MP cameras around the outside of the house. Im pretty techie so I take advantage of getting them all zeroed in and leverage the motion detection recording capability so I only have to review the motion events to see what goes on around the house. Didnt realize my house was like Wild Kingdom with various types of wild life coming through the yard throughout the day and night. As far as this new camera, I like the higher resolution over my 4MP cameras but it doesnt have as high a resolution as their RLC411 5MP. The 411 has a video resolution of 3070X1728 while this 5MP prototype has a resolution of 2560x1440. Its better resolution than their 4MP though. i do notice the nighttime clarity to be better though and I do like the sound feature that my other 5MPs do not have. Personally, I would buy this camera over the 4MP version due to better night vision and resolution. But if true 5MP resolution is what you want, get the RLC411 5MP. I received a prototype 5MP RLC-410 to test and provide a review. I currently own two RLC-410 (4MP), two RLC-420 (4MP), and a 5MP Super HD PTZ RLC-423 - which make up the camera system around my home. I replaced the 4MP RLC-410 that I had covering my front door with the prototype 5MP RLC-410. The increased clarity allows more detailed captures of faces that come to my door. Before, there were a few videos where I couldn't make out exact faces... with the 5MP camera, there is no dispute. I plan on purchasing and replacing one more of my 4MP cameras (back door) with a 5MP version, so my points of entry have 5MP cameras mounted. The 4MPs will be re-stationed around the corners of the house. The 5MP PTZ RLC-423 will remain above the garage. I've been testing this camera for six days, and I can say the features (5 megapixels notwithstanding) are an improvement over the 410s. I find the best feature in my environment is the ability to turn off the infrared. I have this monitoring my driveway, which does not get very dark since my porch light is always on. I let the camera automatically switch to black & white at night, and the images are quite clear (you can see in my video). That said, night time color video is quite inferior to the 410s compared to the prototype with the infrared switched off. I re-installed the PC software and now the camera works great on my PC too. Nice camera that covers a huge area of my yard and back of the house. Really helped fill in the blanks of our video surveillance. On the Iphones it allows you to zoom in on any area it covers. Thanks for the opportunity to review the RLC-410-5MP camera. I noticed that the camera is mounted on the base up side down if you are using it high looking down. Had to fix that right away. I mounted the camera in a tree about 30 feet off the ground so I could get a good view of our pool and the back of our house. Ran 200' of cat 6A cable to the NVR. The camera works great when using the NVR and Iphones (mobile app). When trying to use my PC software I keep getting a error message saying that NVR(2) had an error in the password. So with this camera connected to the NVR it makes it impossible to use my PC with the camera and also made it so I can't use the other camera connected to the NVR. Must be a PC software glich? The resolution is good and it works flawlessly on our iphones and ipads. The picture and night vision aren't quite as good as with my reolink PTZ camera. Overall a good camera. I'm spoiled with the reolink PTZ so this camera is just ok, not great. This is a solid 5 star camera however the bracket where you tighten to lock the camera in place needs to be made of stronger metal. Compared to the 4MP camera this camera has an updated and brighter night vision. As for the picture it appears to be clearer then my 4MP cam. I would even say the camera is better then my 411 5MP camera. It has been my experience that you can get some good face pictures from a considerable distance 25-40 feet may further during the day. When using night vision the lights tend to wash the face out but I think this is true to many cameras. I am super amazed by the progress and the quality fo Reolink cameras. These cames have better quality than their counterpart and not to mention the mobile app, is one of the best mobile app in the market. I am using Reolink for my home and for few of my customers, They are simply loving it. Reolink: Thank you for being around! Picture quality is consistent with what we have come to expect from Reolink. This model has an external panel to access SD card slot, yet remain IP66 intrusion rated. Mounting system is simple and secure. The additional software option to turn off LEDs is useful if the unit is used to view through a window. 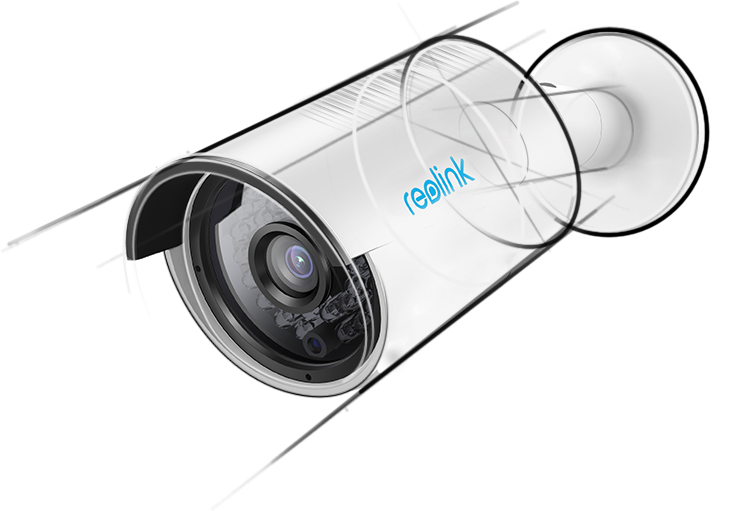 This is a first-class camera compared to the standard Reolink RLC-410. I own both, the RCL-410 and RLC-410S. The difference is the SD card slot. Now, I would invest $10 more and get the one with SD card. The new camera’s physical build quality is well-intentioned; the camera in incased in sealed, aluminum body. In addition, there are great improvements in lens quality and camera design. The lens quality is better and the image sensor is significantly sharper. The new camera is built on a pivot, so you can easily move in direction you wish. There are 20 or so, LED strip lights on face of camera, producing mores superb view during the night, even as far as 20’ away. I’ve attached video for you to check. I like the clarity and wide angle is amazing. I could get the whole front of 2-story house (mounted 10' high). New camera design has a built-in SD card slot on back with easy access and convenience. There are only two small screws holding the SD card cover. I could setup new camera within a minutes. You can scan the code located on camera or use the search menu, it was exactly as described. I used POE splitter so there is only one cable, otherwise you need to get power adapter and access through PC or phone and setup as desired. The alarm triggering is working great; you can adjust the sensitivity and cover the area as needed. There is a lot of options on Reolink camera app, play with it to get the best results. I use the default setting and went from there.